No matter the time of year here, we at the Stanton House Inn get a significant number of questions regarding our bees. 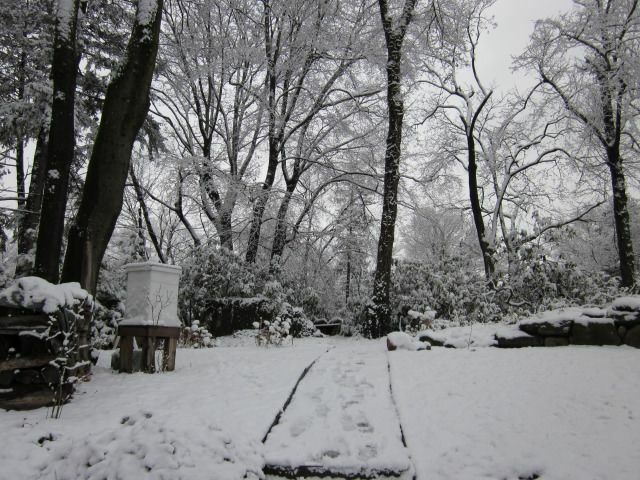 The most common question regarding winter beekeeping is: how do they survive the winter here? Our bees are the typical type with which most beekeepers in America deal: Italian. They are known for being producers of ample supplies of honey and being very calm (IE: they’re not very quick to sting). No matter where they’re from–the most common bee breeds in America are Italian, Caucasian, and Carniolan, but more are being imported from such places as Russia to deal with varroa mites and other bee problems–bees are very tolerant of cold temperatures. Considering they’re cold-blooded (and most insects die during the winter), I’d say it’s a wonder of biology. To stay warm in cold temperatures, bees cluster closer and closer together in their hive until they form balls made entirely of bees when the temperature drops below 55 degrees Fahrenheit. The ball has the queen, the matriarch of the hive and the source of new eggs and therefore new bees, at the center in the warmest location. Surrounding her is a huge mass of worker bees whose job through the winter includes feeding each other and the queen as well as keeping the entire hive warm. These bees circulate back and forth in the ball, so that none of the bees are outside and exposed to the cold long enough to freeze or suffer damage. One bee will start-out next to the queen, then slowly move to the outside of the ball, then back again, all winter. Heat is produced from the friction of all these cold little bodies rubbing against each other all winter. While cold temperatures seem especially bad to bees, in reality it’s windy conditions or drafts that can kill a bee most easily. Bees deal with the problem in their own hives by sealing all holes and keeping all passages and entrances as small as possible. We keep our beehives in front of a hedge of trees to protect them from northern winds and at the top of a slope so that wet cold air flows down and away from the hives. Our biggest concern now is whether our two hives are alive. You can check during cold weather by putting your ears against the hive and knocking on it quickly. If the hive’s still alive, you’ll hear buzzing that quickly ceases again. If you don’t hear anything, the hive is probably dead. The other way to tell is if any bees leave the hive on warm winter days. As soon as a warm day hits, the bees separate and spend as much warm time as they can removing waste from the hive (including bees that died) and collecting whatever food and water they can. If bees are moving around, it’s fairly easy to say the hive has made it through the winter thus far. The problem for us is that we haven’t had one of those days in a while and therefore cannot tell if our surviving hive is still with us or not (the other one didn’t survive the last cold spell, unfortunately). What could kill a hive in the winter, besides the obvious cold? Well, it’s usually not so cut and dry as the bees got too cold and died. It’s usually a range of factors: cold, not enough food stored, water, or a weak hive entering into the winter. If a hive is too weak from disease (like varroa mites) or pesticide exposure (or both), the bees will often not be healthy enough to survive the roughest part of the year, similar to the human body. While we do not use pesticides or herbicides on our property, we know that our neighbors do. Bees can travel up to five miles away from the hive in search of food and water, providing quite a few opportunities to be exposed to the greatest modern threat to bees in America: pesticides. Exposure to such strong chemicals that kill other insects may not kill the bees (though pesticides are not so precise in whom they kill), but will weaken their immune systems and make them more susceptible to other threats. I do have to report, however, that I can tell when one of my neighbors has used pesticides on their property by the number of paralyzed, disabled, or obviously ill and dying bees I find around our own property on those days. Some food for thought the next time you use any on your lawn, just sayin’. For more information, and to read the experience of a beekeeper in another chilly climate (Chicago), read this blog post about winter beekeeping. And if you’d like to check out our hives, be sure to come by the Stanton House Inn for a visit!